PGI SuperCore Semi-Automatic Biopsy Instrument is a lightweight, adjustable throw (9.5mm and 19mm), and easily maneuvered biopsy instrument. After setting the cutting cannula spring, the PGI SuperCore Instrument may be operated with one hand leaving the other hand frre to manipulate a guidance device; i.e. an ultrasound probe. 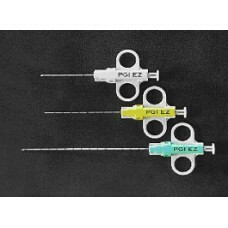 PGI SuperCore with its dual throw capability is a further upgrade to the very popular PGI EZ Core single throw devices. $30 ea: Introductory Pricing $25 ea; 1-5 pc 5% discount; 6-10 pc 10% discount.